Our Troop was established in 1993 and has a membership of 113 boys. We meet in Plano at the Canyon Creek Presbyterian Church on North Star just north of Renner with Troop Meetings the on Sundays at 3:30pm. We have a monthly campout except for summer months when Summer Camp, High Adventure Treks, and Jamboree trips are the primary focus. Below you'll find summories of a few events and the fun our boys have had over the years. Our troop is a boy led organization. This means that as much as possible we want our boy scouts to both make the decisions for the troop, and to be responsible for the implementation of those decisions to create a fun and purposeful scouting program. The adults have to take a step back, and allow the boys to learn from (safe) failures as well as successes. Adults should intervene immediately if safety is an issue. However for most other problems, rather than intervening directly, adults should inform the Troop leadership – the Senior Patrol Leader (SPL), Asst. Senior Patrol Leader (ASPL), or the appropriate Patrol Leader and let them handle the problem. The Troop is organized into Patrols. Each patrol consists of (typically) 6 - 10 boys generally in the same age range. A patrol is the basic unit of operation for the Troop. Patrols usually sleep together, cook together, and do the same activities. Each patrol purchases the food needed by the patrol for each campout. Patrols can do activities specific to that patrol (i.e. a patrol could go camping with appropriate adult leadership.) Each patrol is managed by the Patrol Leader, who is in turn responsible to the Senior Patrol Leader. Another difference from Cub Scouts is that we do not have family camping. Our troop policies allow only males to stay overnight at our activities. Additionally, all adults should take Online Youth Protection Training before their first campout. On the second day of our Seabase Trek, we had anchored off Man O War Cay for the evening. In the distance, I noticed a storm forming. I noted the position of the sun and crossed my fingers that the storm would get bigger. Mother Nature did not disappoint. I watched and took pictures of this storm for at least 30 minutes. The Scouts did not seem to notice it much. The boat captain and I enjoyed the show though. It was remarkable to see how these storms form quickly and then dump their rain quickly and fizzle. Read more about the trip, including a photo diary and more! While some teens were busy attending camps, playing Xbox, or just sleeping late over the summer, 22 teens and six leaders from Troop 1776 were off on an adventure. 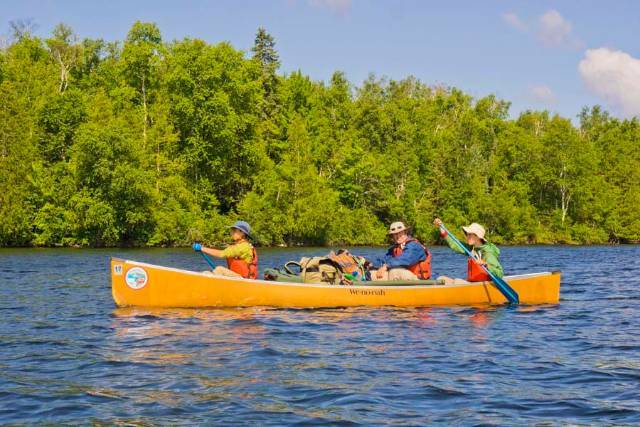 An adventure that provided them an opportunity to learn how to master a canoe, have some great fun fishing, and hone their camping skills, all while being totally disconnected from the real world. The Scouts took part in a high adventure program called Northern Tier, known as the Boy Scouts of America's oldest national high adventure program, outfitting scouting groups for canoe trips since the summer of 1923. Possibly the largest contingency from any single troop in the United States. Jamboree troops are typically comprised of multiple troops from a council. Troop 1776 provided all the leaders and the majority of the scouts for two Jamboree troops. Between scouts and adults we had 80 Troop 1776 members involved at the first National Jamboree at the Summit Bechtel Reserve!! The Valley Forge Pilgrimage and Encampment is the oldest annual Scouting event in the World. The event is hosted by the Cradle of Liberty Council and commemorates the soldiers of the Continental Army who braved the winter of 1777-78 at Valley Forge. Each year more than 2,000 brave the winter chill of the Delaware Valley to participate. At the final night's Arena for the National Jamboree 2010, Scouts from Troop 1776 played a significant role. This show had a live audience of 70,000 and was broadcast on National television through a cable network. You have to watch the video to believe. At approximately 3:58:00, Tyler Hemenway is featured significantly in introducing the new Scout High Adventure Base, the Bechtel Summit, 4,000 fantastic acres in West Virginia. 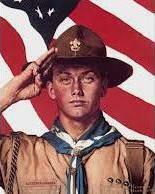 Our boys lead the 70,000 Scouts and Scouts in the Scout law at the end. They are the boys in the red hats, at mark 4:51:00. What a night to remember!!! Youth membership numbers from as reported by the annual recharter. 2016 membership is from the BSA National Roster mid-year.